For more information about The Mighty Sparrow, please click here. Update about the Mighty Sparrow, performance by Lord Relator. For a video of Lord Relator, please click here. The Mighty Sparrow has been hospitalized and will be unable to make the Lecture. 1. 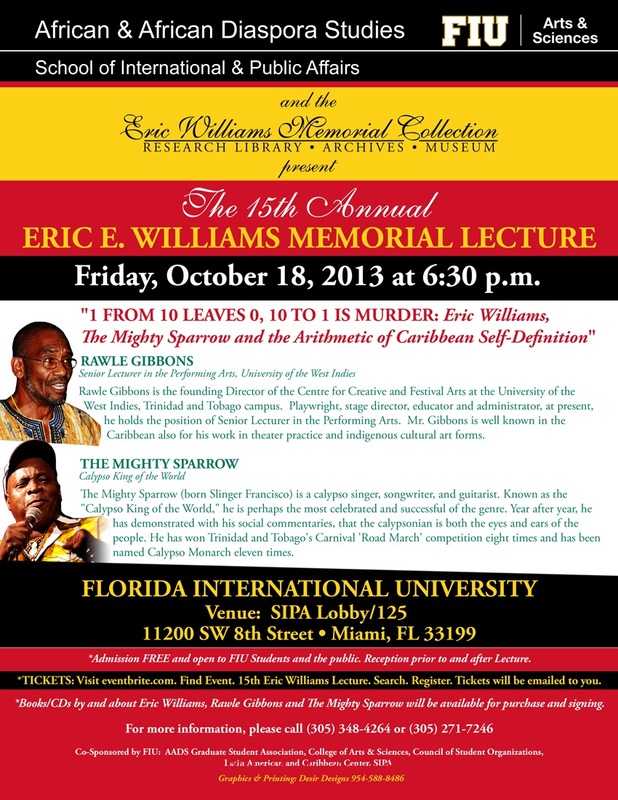 The Lecture will be dedicated in Sparrow's honor. 2. To perform the parts that Sparrow would have, we are fortunate to have Trinidad and Tobago's Lord Relator - nicknamed the local Sammy Davis - a calypsonian par excellence since the 1960s, who has performed with international stars such as Billy Ocean and Jimmy Cliff. Known for his accurate impersonations of the famous - in a calypso context - Relator is also highly skilled in the art of extemporaneous calypso - the ability to "compose impromptu lyrics about any subject, at any time, without previous thought or study." All attendees must have a ticket in order to enter. Please click here to receive your complimentary ticket. You must register on the website in the link above in order to obtain ticket. Do not hesitate to call us at 305-348-6860 with any questions or concerns.